Earlier this week I added the Flickr app to my smarter than me phone. I found all sorts of pictures dating back 2002 when I was still sewing garments and knitting. It also means I found the only picture I have of the quilt which gave me the Quilt Pox. 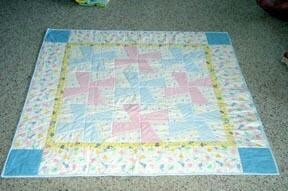 Oh sure, my first full size quilt was done back in 1980, and I made a couple of quilts as ‘model garments’ when I was working at Northwest Fabrics & Crafts in 1990-1991, but it wasn’t until I made Pastel Pinwheels for my nephew that I the Quilt Pox took hold. The pattern is from Quilt it for Kids for 2000. I thought it was a great pattern and collected pastel flanels to make it, but back then I thought you needed to know where a quilt was headed before you could start it. — I’ve gotten over that. Anyway, the pattern and fabric sat until my nephew was born and then I went shopping for additional fabric. I started the quilt on 7/28/2003 and finished it 8/2/2003.